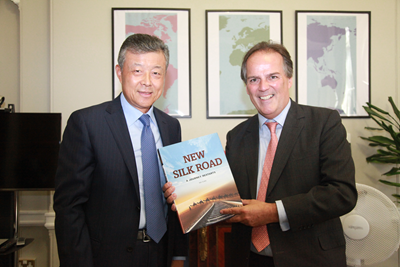 On July 5, 2017, Ambassador Liu Xiaoming met with Mark Field, the newly appointed FCO Minister of State at the British Foreign Office. Both sides exchanged views on China-UK relations and issues of common concern. Ambassador Liu congratulated Mr. Field on his appointment as FCO Minister of State. He noted that this year marks the 45th anniversary of China-UK ambassadorial relations, and it is also a year for consolidating the "Golden Era" of China-UK ties. The leaders of both countries have exchanged several letters to express their determination and confidence in developing the "Golden Era". He expressed the hope that the two sides would plan the next stage of high-level exchanges well, further deepen pragmatic cooperation in various fields, and properly handle sensitive issues to ensure the healthy and stable development of relations between the two countries. Field said that Britain attaches great importance to the development of UK-China relations. At present, the two countries are witnessing strong development in bilateral relations, and both sides are facing new opportunities for cooperation in trade and investment, finance, infrastructure and the Belt and Road Initiative. Britain is willing to work with China to seize the opportunities to deepen cooperation and continue to achieve new results in the "Golden Era" of UK-China relations.